Traveling is good, but it ruins you for home. I fell so in love with Taiwan that I started missing it even when just packing my bags to return to the States. The people, the way of life, the constant excitement of learning a new language, the food, the fruit... So you can be sure that the first thing I did after stepping foot on US soil was to persuade my dad, who had come to pick me up, to swing by a 99 Ranch Market on the way home to Santa Barbara so I could search for some comforts. No lychee-flavored beer to be found, alas, and after the traditional produce markets of Kaohsiung, that LA supermarket was a sad place to be. However, I totally brightened up when I spotted big, beautiful bunches of kōng ​xīn ​cài (空心菜). The familiar stalks and leaves gave me a glimmer of hope that yes, in the midst of this reverse-culture shock, life will be okay, I can get through this, all is well. 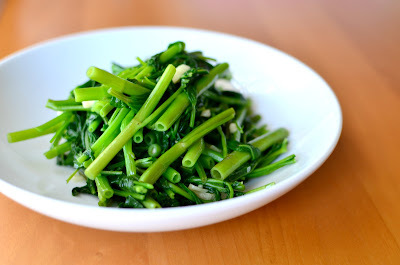 Meet kōng ​xīn ​cài (空 心菜), or "water spinach," as it's known in English. This will quickly become one of your new favorite vegetables, if it isn't one already. What struck me first about these greens is that the stem is hollow, thus the very appropriate Chinese name literally meaning "hollow heart vegetable." 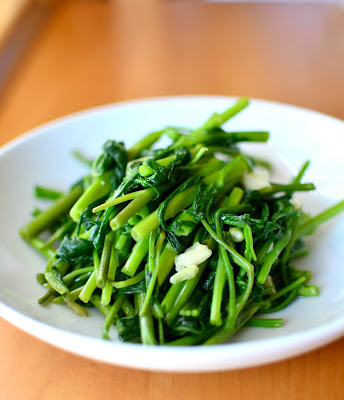 The novelty of the stems intrigued me, and while living in Taiwan this past summer, I kept getting drawn to these veggies over and over again--the sauteed leaves so soft and succulent, the textural contrast of the tender, crunchy hollow stems, and the delicious flavor of greens and garlic all had me hooked. And thanks to some tips from a couple of Taiwanese American friends who were in Kaohsiung with me, I have been able to recreate the yummy dish of kōng ​xīn ​cài cooked right here at home! I'm so excited, I've got to share it with you all too. Wash kōng ​xīn ​cài and shake lightly (no need to dry thoroughly). Trim and discard the brown tips from the bottom of the stems, then, keeping the bunch together, cut kōng ​xīn ​cài into 2 to 3-inch long pieces. Heat the vegetable oil in a large non-stick pan or seasoned wok over medium-high heat. When oil is hot, add garlic and cook for a few seconds, being careful not to brown the garlic, then add stems of kōng ​xīn ​cài and cook for a few minutes, stirring to coat stems with oil and garlic. 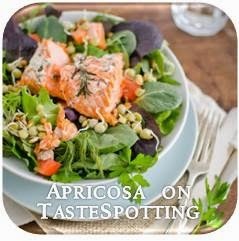 Add leafy tops, sprinkle with salt, and then add 1/4 cup water to the pan. 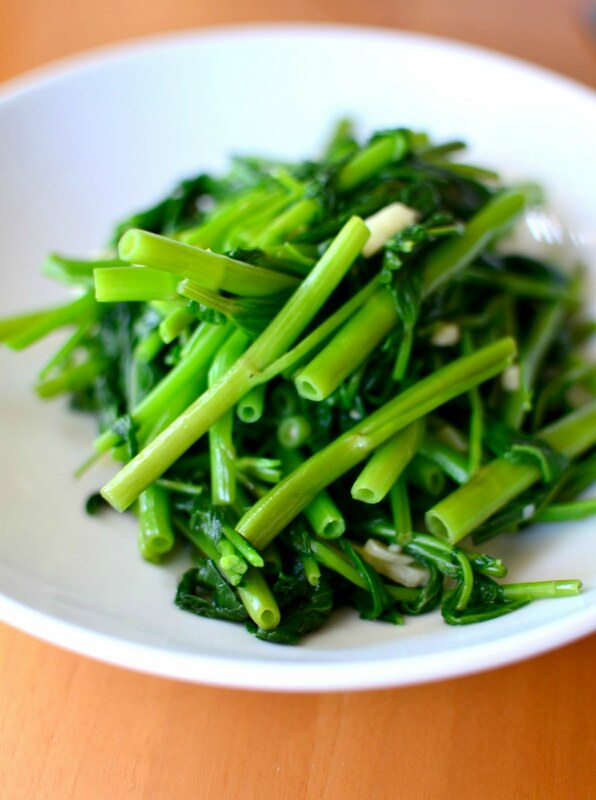 Continue cooking over medium-high heat, tossing vegetables frequently, until leaves are wilted but still bright green. To finish, add a splash of Chinese rice wine and then adjust seasoning with a little more salt as desired. Serve warm.